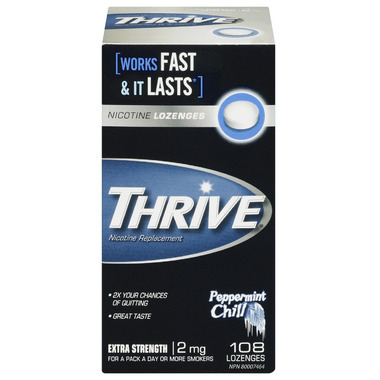 Thrive® Lozenges provide a release of crave-busting nicotine to quickly to satisfy your cravings as soon as they occur. They're both convenient and discreet, so you can use them to manage urges in almost any type of situation, no matter where you are. Each Lozenge contains 2 mg nicotine (as nicotine bitarate dihydrate). Non-Medicinal Ingredients: Aspartame (contains phenylalanime), magnesium stearate, maltitol, menthol, peppermint oil, polyacrylate, silica, sodium carbonate, sodium bicarbonate, xanthan gum. Good: Very good product. Best NRT-Lozenge. Bad: Have quit smoking but cannot do without these. Helps you quit smoking. I had smoked for over 30 years and have tried to quit before but this time with Thrive I can now say I have quit. This is the perfect stop smoking aid I have used. I was not a heavy smoker but to quit I needed a little help with the cravings. I can say that this product will help me be successful in quiting. This is a smoke-free vehicle for nicotine that I prefer to gum or patches or inhalers. I prefer the cinnamon and cherry flavors Commit and some U.S. drugstore brands carry. But the Thrive mint flavor will do. Thrive is less expensive and the packaging is somewhat more eco-frirendly. (1) One transfers one's addiction from one vehicle to another. Nicotine-free life remains elusive. (2) The artificial sweeteners can cause gas and loose bowels. (3) Having the nicotine dissolving in the mouth constricts the vessels. Once, when I used it under the tongue too often, the saliva ducts closed and became infected.